How to make a 1up 1down fishing rig with photo. Don't do what I did and not bother buying the pieces because it looked complicated. Believe me it's not and it feels very rewarding when you go fishing using your own, home made, fishing rigs and even more so when you start landing great fish off of them. It will also save you a lot of money! In most fishing tackle shop you can buy the crimping pliers but if they have them get the ones which have the tip of the pliers bending over at quite a large degree because these also making great pliers for getting hooks out of fish! As with all rigs they are very flexible in design. 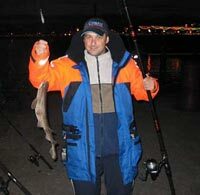 As an example the bottom line and hook you see I often have much longer so it lays on the bottom on the bed way past the weight as this image of me with my catch shows. I then cut back if the top one is producing better results. For the main line (the one you'll be crimping) make it around 20 inches in length. Start off with the first crimp around 3 inches down from the top swivel. Next you place a bead along the line. Depending on the size of the crimp you may need to buy both the small and large beads in case a large bead slides over the crimp. Now you add the swivel but you don't use any knots. Just let it move freely. Follow up with another bead and then a crimp. Finish off with a weight clip at the end. Once that's done I then add the two lines to the two swivels. I don't bother attaching the hooks on the two loose lines until I'm at my fishing spot. It makes carrying them about easier and you can decide what size hooks to use when you get to a location and ask the others fishing what's about.